In his Seattle & Issaquah practice, Dr. Michalak is pleased to offer the most recent advances in laser treatment for patients desiring a comfortable, effective way to remove unwanted hair. With a beam of laser light, we can help you solve the problem of unwanted hair and unveil your naturally smooth skin. GentleLASE Plus™ Alexandrite Laser therapy (with a Dynamic Cooling Device) is a thoroughly tested, clinically proven method of hair removal. Treatment is relatively quick and removes unwanted body hair without damaging the surrounding skin. Our patients who want to rediscover the ease, beauty, and confidence of hair-free skin can now have the sheer, smooth appearance they’ve always desired. Some patients may require a greater number of treatments before satisfactory growth interruption occurs. 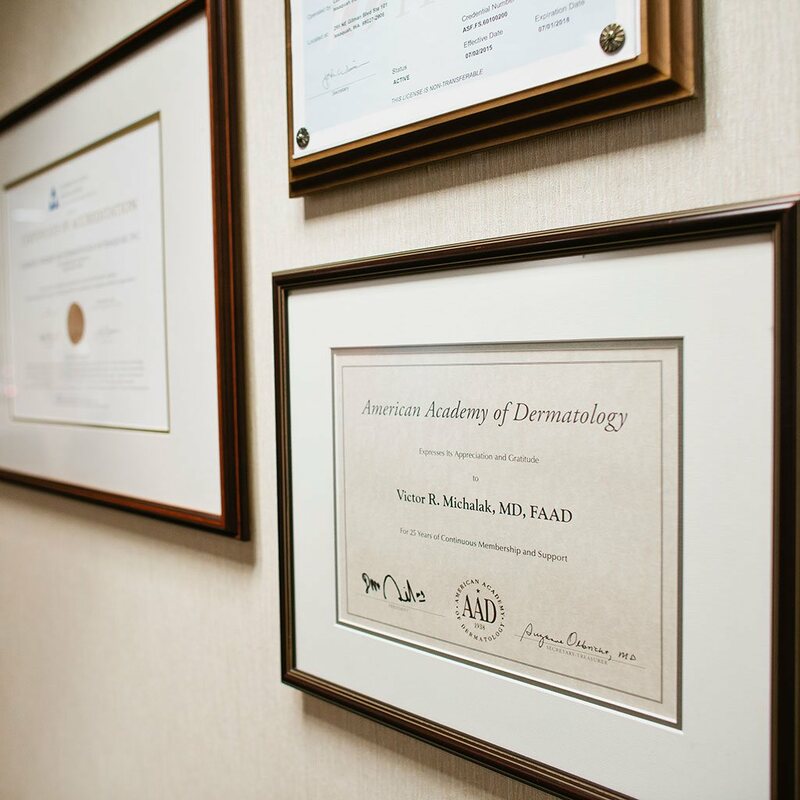 Unlike traditional methods of hair removal, this clinically advanced procedure is performed under the guidance and supervision of Dermatologist Dr. Michalak, an expert in laser surgery and laser procedures. The laser emits a beam of light that passes through the skin to the hair follicle. The energy is then transformed into heat, which destroys the follicle. Laser technology makes it possible for laser energy to “select” only hair follicles while sparing surrounding skin from damage. This brings the cosmetic results you want with the clinical results you need. How do I know if I am a candidate for laser hair removal in Seattle & Issaquah? Almost everyone is a candidate for hair removal with the GentleLASE Plus™ Laser. The most dramatic results occur for patients with light skin and dark hair, but DCD™ makes it possible for patients with darker skin to receive greater benefit from the procedure. Other factors can influence the treatment process and are evaluated during your initial consultation. Most patients describe the treatment as a series of slight pin pricks to the skin. Most patients experience this sensation without requiring anesthetics. Within about 30 minutes of treatment, the area may become pink or red, and this may last from a few hours to one day. Occasionally, a topical anesthetic may be used prior to treatment in sensitive areas. Hair grows in cycles. The laser only affects hair when it is in its early-growth phase. The laser will disable follicles that are actively producing hair at the time of the treatment. At any time, some hair follicles are dormant. Repeated sessions will treat these follicles when they re-enter the growth phase. For many men and women, unwanted hair can be an embarrassing nightmare. Traditional hair reduction techniques such as shaving, plucking, and waxing provide only temporary relief and may actually stimulate hair growth. Electrolysis can be effective, but often requires years of painful, continuous treatment. Many people are now seeking laser treatment for the reduction of unwanted hair. The GentleLASE Plus™ Alexandrite Laser with DCDTM provides consistently reproducible results as substantiated by quality clinical research and peer review. It differs from other hair reduction lasers on the market in that it utilizes the best-known combination of clinical factors to isolate the energy of the treatment to the hair base and not the skin or other unwanted areas. The result is a more effective treatment for patients with a larger range of skin tones treatable. The Alexandrite Laser increases both the destructive effect on the hair follicle and the protective effect on the skin. Stay out of the sun for 2-3 weeks. Treatment should not be performed on a suntan or sunburn. Do not tweeze, wax, or use a depilatory agent for 1 month. Shave area to be treated 12-14 hours before treatment. (If hair growth is heavy, shave just before coming to the office. Do not wear makeup, deodorant, perfumes, lotion or powder on areas to be treated. Patients will be asked to wear protective goggles to avoid exposure to direct or scattered laser light. The area to be treated may be shaved if it hasn’t been already. A yellow or light colored marker may be used to outline the treatment area to serve as a guide for the laser hand piece. The laser handpiece and the cooling device are then positioned on the area to be treated. Laser pulses, described as a wave of heat with the sensation of a pinprick, are delivered to the area with a 10% overlap between the pulses. The cooling device should cut down on any discomfort, but a topical anesthetic can be applied, if necessary. The area treated will resemble a moderate sunburn. Loose, natural fiber clothing is recommended, and a broad-spectrum (UVA/UVB) sunscreen of SPF 30 or higher should be applied whenever exposed to the sun. Try not to rub, scratch, or pick the area treated—ointment may be applied to prevent drying and create a soothing effect (Antibiotic ointment should be used if there is any blistering or breakage in the skin). Swimming, sports and/or strenuous exercise should be avoided for the first 2-3 days. Patients should contact the office if there is any indication of infection (redness, tenderness or pus). History of previous treatment methods, current medications, allergies and pigmentation problems should be discussed with your physician prior to treatment, as well as any questions regarding your condition or medications. The following medical conditions are contraindications to the use of a laser for hair reduction: Epilepsy, Herpes, Lupus, Pregnancy, Melanoma, Keloids and Psoriasis. The following medications are photosensitizers and may make the skin more sensitive to sunlight and laser light and may lead to greater chance of adverse reactions from the laser: Non-Steroid Anti-Inflammatory Agents, Tetracycline’s, Griseofulvin, Phenothiazines, Thiazide Diuretics, Sulfonamides, DTIC, Chloroquine, Methotrexate, Sulfonylureas, Fluorouracil, Vinblastine, Aspirin (daily use) and some vitamins (daily use). Where is the best place to have laser hair removal performed in Seattle & Issaquah? The best place to have laser hair removal in Seattle & Issaquah performed is in a medical facility where there is a physician on-site who is an expert in laser procedures. This helps to ensure that the procedure will be performed safely and on the appropriate candidate. Dr. Michalak is an expert and has been performing laser procedures for over 15 years. He was one of the first doctors in the country to offer laser hair removal.